The Toronto-born electro-house music producer, whose real name is Joel Zimmerman, has teamed up with a range of collaborators including Imogen Heap, Cypress Hill and My Chemical Romance's Gerard Way on some of the tracks on the record. The 31-year-old has already headlined the Wireless Festival in London, and is set to perform at Creamfields in Cheshire on August 26. He has also been confirmed on the bill for this year's iTunes Festival at Camden's Roundhouse, taking to the stage on September 9. 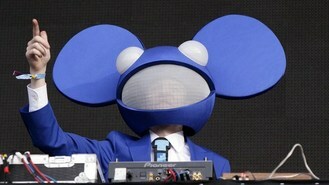 Deadmau5 previously tweeted that his mother prefers music from US DJ-producer Kaskade (whose real name is Ryan Raddon) to his tunes. "Is it kinda weird that my mom's a bigger fan of @kaskade than me? really mom? really?" he wrote.